The first Korean to visit France, the translator of the first Korean tales to be published in the West, as well as the assassin of the reformer Kim Ok-gyun, yet relatively little reliable information about Hong Jong-u is available in English. The main source of information about him is a Korean volume 그래서 나 는김옥균을 쏘았다 (So I shot Kim Ok-gyun) by 조 재곤(Jo Jae-gon) and published by 푸른역사 (Pureun yeoksa) in 2005. The page numbers in the following text refer to this volume. There is a summary of the main contents (in Korean) in Yonhap News . Hong Jong-u (洪 鍾宇) was born on the 17th day of the 11th lunar month, 1850 [page 31], probably in Ansan, Gyeonggi province. He was the only son of Hong Jae-won (洪 在源, 1827-1898), of whom virtually nothing is known. His mother was a member of the Gyeongju Kim clan [page 63]. Hong Jong-u's Ja was SeongSuk (聲肅), his Ho was Ujeong (羽亭), his clan was the Namyang (南 陽) Hong clan, he was the 32nd generation (세 손) of the military branch (남양군파). The Namyang Hong clan formed part of the Noron (老論) Old Faction and some members held significant posts throughout the later Joseon period, but Hong Jong-u was descended from Hong Gye-deok (洪啓德), the third son of Hong U-sung (洪 禹崇), early in the 18th century, and none of his ancestors during those 5 generations held any official position. For many years, until 1894, Hong Jae-won lived in Gogeum-do in South Jeolla, where he is said to have known great poverty. He died in the 6th month of 1898 and received posthumous honors as 가선대부 의정부참찬 (official at the State Council), as part of the reward for his son's patriotic act in killing Kim Ok-gyun. Hong's mother died in the 3rd lunar month of 1886. By this time he was married to a woman from the Jeonju Yi clan born in 1855. According to Régamey, they had one daughter. It was probably only after his return in 1893 that Hong discovered that his wife had died in the 11th month of 1892 (or May 1893, according to his note to Régamey from Kobe). At some later date he married a daughter of Park Haeng-ha who was much younger than himself, born in 1876. They had two sons and a daughter. The elder son, Hong Sun-bok, was born in 1897 and the second, Hong Sun-jin, in 1903. The daughters later married, their husbands’ names being Kim Kyu-seok and Park Gwang-rim, and the name of Hong Sun-jin is found once among the members of a church in Wando island in 1926. Beyond that nothing is known of the family’s further history. [page 253] In the autumn of 1899, Hong arranged for the reburial of his mother, father and first wife together in graves located in what is now Yeoksam-dong in Gangnam. The death of Hong Jong-u is recorded in the family register (족 보 jokbo) as the 2nd day of the first lunar month 1913. There are differing, unreliable reports of his final years, and nothing certain is known of where he died; Mokpo and Incheon are both mentioned. Several reports claim that he died of starvation. An informative article about Hong, written by the French artist Félix Régamey (1844 – 1907), was published in Volume 5 of the review T'oung Pao in 1894, soon after the arrival in France of news of the killing by him of the Korean reformer Kim Ok-gyun. Régamey reports that Hong said he was present on June 4, 1886, as a secretary, at the ceremony marking the signature of the Treaty of friendship and trade in Seoul, by Francois George Cogordon and the governor of Seoul, Kim Man-sik. But it is not clear what his position can have been, there is no record that he held any official appointment at that time. The article by Régamey is particularly interesting for the echoes it gives of Hong's political opinions at the time of his stay in France. Régamey quotes Le Figaro, where an appeal in Hong’s favor explicitly stated that Hong belonged to the Kaï-hua-to (改化 道 usually known as the Gaehwa-pa), "the liberal party." This coincides with the statement in the 1894 article by J.-H. Rosny, that Hong Tjyong-Ou had been "a lieutenant of Kim-ok-Kium [sic] in 1884." Equally significant is Régamey's summary of Hong's basic political positions: (1) Korea should be completely independent of China, Japan and Russia; (2) the barriers that isolate Korea from the outside world should be done away with. On this second point, Regamey adds that Hong had been a friend of the first Minister Plenipotentiary sent by Joseon to Washington, Park Jeong-yang. He mentions that Park was recalled at the demand of China for failing to respect the Chinese wish that he should be subject to strict Chinese control, since this was a time when China was asserting its right to treat Korea as a vassal state. Hong seems also to have expressed bitter resentment at the British support for the Chinese position in not allowing Jo Sin-hui (조신희), the ambassador the Korean king had sent to Europe, to leave Hong Kong "for 2 years" (1887 - 1890). Hong seems to have decided to visit France in hope of receiving the same inspiration for democratic reform that Meiji Japan had received. In order to earn the fare, he went to Japan in 1888, after obtaining a Korean passport dated 1887 authorizing his visit to France (quoted by Régamey). He worked in Osaka as a typesetter for the Asahi Newspaper and raised funds by giving lectures etc. [page 64] He studied French and Japanese and read much about the outside world while he saved the money he earned. Régamey reports that Hong received a letter of introduction to Georges Clemenceau from the Japanese politician Itagaki Taisuke. Leaving Japan for France, a 40-day journey, he arrived in Marseille and headed for Paris. Régamey says he arrived there on December 24, 1890. Luckily, he had been given a letter of introduction addressed to Fr. Gustave Mutel, a priest of the Paris Foreign Missions, who had spent 5 years in Korea 1880-5, then returned to France to be in charge of the seminary. However, after the death of Bishop Blanc in Korea, Mutel had been appointed Vicar Apostolic of Korea in August 1890 and he left Marseille for Korea on December 14, 1890, just as Hong was arriving. When Hong knocked on the door of the MEP in the rue du Bac, speaking no French, they first called the priests who knew Chinese, to no avail. Luckily, Fr. Pierre-Xavier Mugabure, who had lived in Japan since 1875 (and was later to be archbishop of Tokyo), was there and they could talk in Japanese. A Catholic family was contacted and Hong was given an attic room in their house in the rue de Turenne to stay in (for a while, at least). Félix Régamey was inspector of drawing in the schools of Paris at that time but, more important, he had accompanied Émile Guimet on a journey round the world in 1876-1877, where he was particularly struck by Japan, and he published a number of books inspired by it during the rest of his life. It is an interesting fact that he was involved in the Paris Commune of 1870 and as a result had to go into exile in London for a time. In 1872, he provided financial help for Rimbaud et Verlaine when they in turn arrived in London, and made drawings of them at that troubled time in their relationship. Félix Régamey says he first met Hong Jong-u only a few days after his arrival. He says Hong could speak no French, and when a Japanese interpreter was brought in, Hong very soon showed signs of strong Korean pride and anti-Japanese feeling. The impression of caged fury displayed then impressed Régamey, reminding him of a captured tiger he had seen in Malaysia. Hong claimed that he had come to learn French law and French customs, but he also told Régamey that his ambition was to become leader of a group of young people like himself, currently residing in Russia and the US, who wished to lead Korea in the same direction as Japan’s Meiji reforms, an independent, modernizing transformation. He was, it seems, especially interested in the French political situation. Régamey at once invited him into his home and says that they lived under the same roof “for months.” Later he seems to have lived in 'hotels' in rue Serpente (near the Sorbonne) and quai des Grands Augustins. Throughout his time in France, Hong always wore Korean dress. Régamey (and others) tried to find some benefactors for him, but it is clear that few were forthcoming. There was a fruitless visit to the aged Ernest Renan. Perhaps more significant was the meeting with François George Cogordan, who had been France’s Minister Plenipotentiary in Beijing and had come to Seoul to sign the treaty with Korea only a couple of months after signing the Treaty of Tianjin with China. Deeply moved to see someone he had seen in Korea, Hong threw himself on his knees to kiss his hands, which might have surprised him. However, the official French attitude toward Korea at this time was oddly indifferent; after the signing of the 1886 treaty, it was not until 1888 that Victor Collin de Plancy was sent to be the first French consul in Korea. Cogordan refused ever to meet Hong again, which must surely have humiliated him. In that same year, 1888, the amateur ethnographer Charles Varat arrived in Korea, intending to undertake a study of the country and collect many artifacts from it. That was also the year in which Émile Guimet opened the Musée Guimet in Paris. Many of the objects collected by Varat came into the museum. It was only natural, then, that Hong Jong-u should be asked to help catalogue the Korean items in the new museum, thanks to the help of Régamey, as a way of earning his keep. At the same time, he somehow managed to learn enough French to prepare translations of three Korean texts. The first of these, Printemps parfumé (Perfumed springtime, a translation of the name of Chunhyang, the main character) was published in the the “Petite Collection Guillaume” in 1892, and has the name J.-H. Rosny as the sole author, although the name of Hong is mentioned in a footnote to the Preface. J.-H. Rosny was the pseudonym of the brothers Joseph Henri Honoré Boex (1856–1940) and Séraphin Justin François Boex (1859–1948), both born in Brussels. It seems that Printemps Parfumé was in fact the work of Séraphin since La Convention littéraire de 1935 (designed to distinguish between the share of each in the jointly published works) attributes it to J.-H. Rosny Jeune. The Preface claims that the text is essentially the translation of a Hangeul version of the Chun-Hyang story. Such a text seems to have been available in the Musée Guimet, included among the items sent back from Korea by Charles Varat and Victor Collin de Plancy. The names of the lovers are given here as I-Toreng and Tchoun-Hyang; they meet in the city named Nam-Hyong, in Couang-hoa-lou, which is explained as being “a great house built on a bridge,” rather than “a pavillion beside a bridge.” The French version does not indicate that Chun-hyang’s mother is a “gisaeng” but simply says that she is a commoner. One major difference with the traditional tale is that, once I-Toreng glimpses Tchoun-Hyang on her swing, in order to be able to meet and talk with her he dresses as a beautiful girl. He also pays an old woman to bring them together. I-Toreng then says “she” would marry Tchoun-Hyang if she were a man. Tchoun-Hyang indicates similar feelings. I-Toreng makes her sign a paper to that effect, then reveals that he is in fact a man. They become lovers at once. The rest of the story follows the familiar tale and the later part includes social satire on the way the mandarins exploit the common folk. In 1895, after Hong’s return East, Le Bois Sec Refleuri was published in the Bibliothèque de vulgarisation, a division of the Annales du Musée Guimet. This time, Hong’s name stands alone as the author / translator. He must have prepared the book for publication before leaving with some care, since it includes an exchange of dedicatory messages with Hyacinthe Loyson, who mentions visits by Hong to his family home in Neuilly. “Father Hyacinthe Loyson” (originally Charles Loyson) was a particularly celebrated figure in religious circles and one can only wonder how Hong came to develop such a deep friendship with him. The dedicatory messages have little or nothing to do with the contents of the book, being on both sides concerned with mutual respect and questions of faith. Loyson had been a Catholic priest, a Carmelite, and fron 1865 preached the lenten Conférences at Notre Dame de Paris for several years. His modern ideas led to his expulsion from the Catholic Church in 1869. Some years later he married an American widow and they finally settled in Neuilly. He gave frequent lectures and was associated with various “Old Catholic” groups but was essentially an independent, spiritual man with a radically open mind. Summarized as briefly as it can be in all its complexity, it tells the story of two friends, high aristocratic ministers, who are sent into separate exiles with their wives by the machinations of the wicked and ambitious prime-minister Ja-Jyo-Mi. The wife of one of them, Sùn-Hyen, gives birth to a daughter named Tcheng-Y, then dies. Sùn-Hyen weeps so much he becomes blind. The years pass quickly and the story follows that of the familiar Sim Cheong tale, with the father rescued from drowning by a “hermit” and told that in return for 300 sacks of rice prayers will be said, his sight will be restored, and he will become prime-minister. Tcheng-Y duly sells herself to a group of merchants going to China by sea, who want to offer a sacrifice for a safe journey, and sets off with them after arranging for her father to be cared for. The other exile, San-Houni, is murdered by a wicked boatman, Sù-Roung, who has designs on his wife, Tjeng-Si. She escapes and along the way gives birth to a son. She tatooes the name San-Syeng on the baby’s arm then abandons him by the roadside, taking refuge in a nunnery. Sù-Roung finds the baby without knowing whose child it is, adopts it and brings it up well. Again many years pass, the son learns that he is a foundling and leaves home. Arriving in the city of Tjen-Jou he meets a beautiful girl whose father has died and they become lovers; warned by her dead father in a dream that her mother intends to kill her lover, she sends San-Syeng off on her father’s horse with his sword. He gives her the ring left with him when he was abandoned. The king dies, his heir is still a child. The wicked Ja-Jyo-Mi sends him to the island of Tchyo-To in solitary exile. San-Syeng hears of his plight, then in a dream sees a man named San-Houni, who refuses to tell him who he is, but urges him to help the boy-king. He arrives close to Tchyo-To but it is well guarded. We now return to Tcheng-Y, who jumps into the sea but does not sink down to the Dragon King. Instead she lands on the back of a giant turtle that carries her to a cave beneath an island. She climbs up to the surface and finds herself in a beautiful garden; here she meets the exiled boy-king, Ki-si, and they fall in love. Fearing that he will be killed, they set fire to the house and flee down the cave to the sea but there is no boat in sight. San-Houni again appears to San-Syeng in a dream and tells him to take a boat to the island quickly. There he rescues Ki-si and his wife. The population rebels against Ja-Jyo-Mi, Ki-si is hailed as the new king, the prime-minister is arrested, and the new king sends San-Syeng as a secret inspector to check the quality of the local governors. We return to San-Syeng’s lover-wife, Tjyang-So-Tyjei, whose mother has died and who has lost everything in a rebellion. She arrives near the nunnery and is discovered by Tjyeng-Si, San-Syeng’s mother, who recognizes the ring. They identify themselves and set out in quest of San-Syeng. Reaching Saug-Tjyou, Tjyang-So-Tyjei refuses the advances of the inn-keeper’s son, is framed by him, is arrested, and finds herself in the situation of Chun-Hyang, when the magistrate gives her the choice between marrying him and death. Meanwhile San-Syeng has found Tjyang-So-Tyjei’s house empty, in ruins. San-Houni appears in a dream, reveals his identity as San-Syeng’s father and tells him what is happening to Tjyang-So-Tyjei. San-Syeng arranges to be put in the same prison, his horse is recognized by Tjyang-So-Tyjei, all are reunited, the role of San-Syeng as secret inspector is revealed, the magistrate is punished, Sù-Roung is also arrested. When Tcheng-Y, now queen, hears all this she recalls her blind father, a feast is held for the nation’s blind men. Sùn-Hyen finally arrives, very dirty, but when a palace lady criticizes him he makes a very eloquent, wise and poetic reply which is reported to the queen. They meet, his eyes open, he meets San-Syeng and learns that he is the son of his old friend San-Houni. Sùn-Hyen is made prime-minister. Finally, the king wishes to wage war on the Tjin-Han who defeated his father once, and there is still the question of the punishment for Ja-Jo-Mi and Sù-Roung. Sùn-Hyen asks the king to hold a great banquet for the whole population, saying that they should support whatever is decided, war or peace, punishment or forgiveness. He makes a speech in favor of peace and reconciliation, all agree. Finally he vanishes, perhaps taken up to heaven on a cloud. The third work translated by Hong was very different, an astrological treatise of divination, Guide pour rendre propice l'étoile qui garde chaque homme et pour connaitre les destinées de l'année, only published in 1897, again in the Annales of the Musée Guimet, with the name of Henri Chevallier added to that of Hong as author / translator. In a preliminary article about this book, published in Volume VI (1895) of T’oung pao Henri Chevalier explains that the book had been brought back from Korea by Charles Varat and Hong had begun to translate it at the request of Guimet. His departure interrupted the project and Chevalier had taken it over. Chevalier was originally an engineer who worked for some time in Japan, who later developed an interest in oriental languages. Hong must have moved out of Régamey’s house at some point, since Régamey says they only met again shortly before Hong’s departure, when he needed money for the journey home. His description of Hong’s extreme reserve when they parted suggests that he was deeply hurt that Hong expressed no gratitude for all his help and friendship. As we read Régamey’s description of Hong in Korean robes being driven away, smoking a cigarette and not even looking back to wave goodbye, having spent 2 years cataloguing Korean artifacts, and translating Korean texts, it becomes clear that he had made no attempt to learn about French law or politics. Instead, during those years, Hong had focused on aspects of his own culture, and may well have become more strongly aware of the imperialism of France and the other western countries, realizing that Korea would not be able to rely on outside help from any quarter. Where Kim Ok-gyun looked to Japan as a model for Korea’s future, accepted Japanese financial help, had taken a Japanese name and seemed unwilling to recognize the threat Japan’s colonizing intentions posed to Korean independence, Hong had moved in the opposite direction. Hong Jong-u left Paris on July 23, 1893, headed for Marseille. There he boarded the steamship Melbourne and returned to Japan. [page 95] Régamey ends his article with the note he received from Hong after his return, written in awkward French, in which he reports having been sick for some time after his journey and adds the news that letters from his father and friends had informed him that his “poor wife” had died “in May” (by implication 1893). In December 1893, Hong received a visit from Yi Il-jik, who in April 1892 had been charged by the Min faction in Seoul to kill the refugees from the 1884 Gapsin Coup: Kim Ok-gyun, Park Yeong-hyo, Jeong Nan-kyu, Yi Gyu-wan, Yu Hyeok-ro etc. Yi told Hong that it was the wish of the king himself. Hong agreed enthusiastically, it seems. His first task would be to become acquainted with the Gapsin refugees. It was agreed that Hong’s task would be to encourage Kim Ok-kyun to travel to China, and kill him there since he was well-protected in Japan. 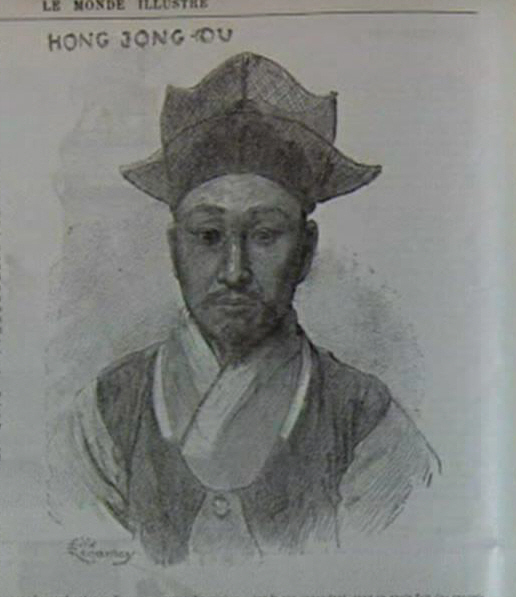 Hong was quite easily able to meet the refugees and join their gatherings on the basis of his family clan identity. He is said to have gained Kim’s trust especially by preparing delicious food in the French style for him and his Japanese friends in Tokyo. At the time, Kim Ok-gyun had been living In Japan for nearly ten years and was not sure that the Japanese would go on protecting him indefinitely; at the same time, he seems to have abandoned his strongly negative attitude to China and begun to formulate a vision in which Korea, China and Japan would best ensure their separate independent status by combining to resist attempts by the western powers to dominate them. Meanwhile the Japanese were already preparing to wage war with China and take a more complete control of Korea; it began to seem to them that the death of Kim in China at Korean hands might serve a useful purpose. This would explain why Japan did nothing to warn or protect Kim after receiving a report written by Nakaga Kotaro (中川 恒太郎) its consul in Hong Kong on January 1, 1894, describing words spoken that day by Min Yeong-ik, the Korean Queen’s nephew, to a group of his supporters there, advocating the assassination of Kim Ok-gyun etc. and even telling them that in Osaka Yi Se-jik [sic] with a Korean recently returned from Europe, named Hong Jong-u, were actively engaged in a plan to that effect. [page 106]. Indeed, the Japanese government had always been less than enthusiastic about the presence in Japan of the Gapsin leaders and it is not always realized that Kim Ok-gyun was humiliated by being forced to spend some 3 of the 9 years he spent in Japan detained in the Bonin Islands and Hokkaido, far from Tokyo. Moreover, he was reduced to political silence, his days were spent eating, drinking and playing Baduk with a few friends. He quickly understood that Korea could expect nothing good from Japan and in mid-1886 had already written to the Korean King warning him against the ambitions of Japan and China. But for the Korean government he was a traitor, nothing more. Finally, Kim seems to have decided to explore the possibility of a visit to China; he had been living with the Japanese name Iwata Shusaku (岩田 周作) but now changed that to Iwata Miwa (岩田 三和). The use of the character for “3” symbolized his new vision of a reconciliation between the three nations of the region. Kim decided to travel to China to meet the great Chinese politician Li Hongzhang. He had been close to Li’s adopted son (his nephew) Li Jingfang (李經方) while he was Chinese Minister in Japan 1890-1892 and there might have been some preparatory correspondance between them. Many of Kim’s associates urged him not to go, some did not trust Hong although Kim Ok-kyun seems to have rejected their warnings. So he and Hong traveled together with Kim’s servant and a translator from the Chinese legation. They reached Shanghai on March 27, 1894, and lodged in separate rooms of the Towa yoko 東 和洋行Japanese-run ryokan in Shanghai. The following day, Hong went out to change money, then returned while Kim was resting in his room during the afternoon and shot him three times with a revolver. Kim died almost instantly. That was just after 4 pm. Hong then fled and was arrested the following afternoon. He changed into Korean robes before killing Kim. Questioned by the police, he said he had killed Kim, first, because he and the other Gapsin conspirators had caused the deaths of many innocent people; second, that he was obeying a royal command. The third reason was that Kim was a threat to the peace of the region, as well as a traitor. Li Hongzhang decreed that Kim had been a Joseon traitor and Hong a Joseon official, so both should be sent back to Joseon at once. Newspaper reports about this are quoted at the end of the article by Félix Régamey, who finds himself at a loss to understand what Hong had done. On April 12 Hong and the corpse arrived at Incheon, where they transferred to a boat for Seoul. 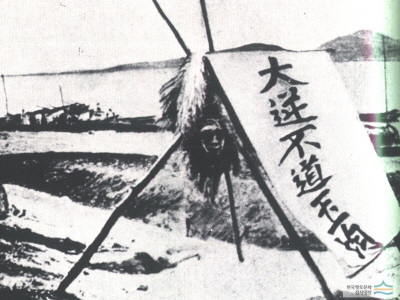 During the journey, Hong had written on a banner the characters 大逆不道玉均 (Traitor Ok-gyun). The body of Kim was left at Yanghwajin, down-river from Mapo at what is now Hapcheong, where it was beheaded, the hands and feet removed, and the trunk mutilated. The parts were sent around the country for display. There is a photo of the head with Hong’s banner. Other measures were taken to punish surviving and dead participants in the 1884 coup, while the families of those officials killed by the conspirators celebrated. In Japan, the press launched a campaign acclaiming Kim as a hero and denouncing Hong as a monster. The short article signed J.-H. Rosny from Le Carillon du Boulevard Brune, 1st year, number 11, May 1894 indicates how perturbed Hong's French friends were on hearing what he had done (original French text with English translation). 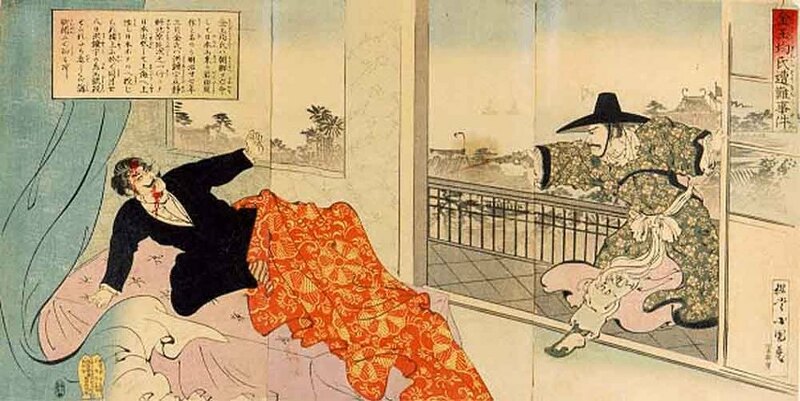 There is no sign that the Japanese romance mentioned in this article was ever published. Trying to understand Hong's deed, Rosny speculates: “Arrested after the murder by the European Police of Shanghai, Hong Tjyong-Ou called for Chinese justice, claiming to have killed Kim-ok-kium on the express orders of the King of Korea. Kim, he added, is a traitor. The excuse would be of little value to us if Hong Tjyong-Ou was merely obeying his king; he had no personal reasons to believe in the perfidy of Kim-ok-Kium. We remember that Hong Tjyong-Ou spoke frequently to us of the violence of Kim-ok-Kium and the following words of Kim to Hong when they parted: Hong - said Kim, - if you ever change opinion, I will kill you! However, Hong Tjyong-Ou in contact with European civilization had changed his opinion. He placed no hope in violence, he did not accept Japanese armed intervention. On his return to Japan, did he try to convert Kim? Did Kim make threats? Did he denounce Hong to the terrible vindictiveness of the Japanese? Did he he perform acts or speak words, which indicated high treason? Was Hong Tjyong-Ou forced to pretend in order to save his life? Did he repay Kim perfidy for perfidy?” Some time later, in another essay, Rosny offered a more nuanced and more detailed portrait of Hong and his inner world: "Et tout d'abord le Coréen lui-même, dans une attitude hautaine et sage et une figure de conviction, fumant sa cigarette, la peau luisante à gros grains, les paupières grasses, les yeux bruns semblables à ceux de nos yeux bruns qui sont plus spécialement des yeux d'intimité et d'intelligence, des yeux qui ne tirent point une beauté du dehors, qui n'éclatent pas ainsi que des bijoux clairs ou de noires étincelles, mais qui ont, dans l'iris, une lumière soumise depuis des siècles à des lois sociales, à une discipline de mots et de pensées. Cela ne va point sans un peu de férocité, si raisonnable soit-elle, et, à l'occasion, le morigénateur consciencieux, le moraliste à la Confucius saura accomplir le meurtre avec une résolution digne de Patrocle ou d'Ulysse. Oui, une âme d'enfant guidée par des conseils de vieillard, telle est l'âme du Coréen, telle est peut-être l'âme de tous les Jaunes. Ils ont encore la violence des temps héroïques côte à côte avec le joug des préceptes et des sentences." There is no way of knowing the precise reasons behind Hong’s attack on Kim Ok-gyun. Was he sincerely devoted to the King and convinced that Kim deserved to die, or was he driven by opportunism? In particular, the indications by Rosny that Hong was well acquainted with Kim Ok-kyun before he arrived in France, that he often spoke of him and that he had been one of his close collaborators at the time of the Gapsin coup, are aspects that are not even mentioned by the Korean study of his life. Certainly, Hong had come back from France empty-handed, and had no prospects of work in Korea. This was the ideal opportunity to establish himself. Whatever his intention, once back in Korea, Hong was soon the toast of the town. He was reportedly hailed by Gojeong himself, who came running out of his rooms in his stockinged feet on hearing he had arrived in the palace. Hong at once became a government official by special royal decree. However, in the months that followed, everything went wrong. The Sino-Japanese War ran from 1 August 1894 until 17 April 1895. During that time, pro-Japanese forces took power in the government and Hong seems to have taken refuge in China. After the murder of the queen by the Japanese in October, 1895, power returned to the conservative side and Hong must have returned from abroad. From February 11, 1896, until February 20, 1897 the King was living in the Russian Legation and in the late summer of 1896 Hong seems to have helped mastermind the arrest of the pro-Japanese officials who had lost power a few months earlier. They were released in the autumn and became involved in the foundation of the Independence Club. Meanwhile, Hong had gained considerable influence with the King and advocated strongly the imperial model of power centered in the King which inspired the creation of the Korean Empire. Late in 1896, Hong was appointed head of the foreign affairs section of the palace administration. Early in 1897, when the Japanese Minister came for an audience, Hong was seated directly beside the King. In the following time, he played a major administrative role in setting up the structures of the Korean Empire and was responsible for composing the new law code. The list of his promotions and career changes from 1898 until 1902 shows how powerful Hong became in the early years of the Korean Empire. At the time when the Korean Empire was etablished in August 1897, Hong was acting as a member of the State Secretariat (비서원승), but by 1898 he was also Secretary General of the State Council (의정부 총무국장), Director of Regions, State Council (의정부 지방국장), General Director of the Department of Farming and Sericulture (농상공부 광산국장), member of the Jungchuwon Advisory Council (중추원 의관), then in 1899 he served as Secretary General of the State Council (의정부 총무국장), Judge of the Pyeongni-won Supreme Court (평 리원 판사), in 1900 Head of the Sariguk division in the Justice Department (법부 사리국장), Chief Justice of the Pyeongni-won Supreme Court (평리원 재판장), in 1901 Member of the Council of Rituals (봉상사 부제조), member of the Jungchuwon Advisory Council (중추원 의관), in 1902 he was Palace Administrator (태 의원 소경) and so held controlling positions in the departments of diplomacy, justice, administration, administration of legislation, industry. Hong, together with two other men of humble origin, Gil Yeong-su and Yi Gi-dong, known as the “Hong Gil-dong trio” enjoyed unrestricted access (별입시) to the Emperor and exercised immense influence. One reason for Hong’s final downfall is easily summarized. He was completely unable to understand or sympathize with the growing demands of the international business community and opposed many financial and administrative measures which others judged essential. One episode from this period is of special interest. In 1899, Hong Jong-u was presiding judge of the high court known as the Pyeongniwon. This was the time of the conservative crackdown on the members of the Independence Club at the end of 1898 and among those on trial was a young student, Yi Seung-man, better known in later times as Syngman Rhee. As the head of the Hwangguk Hyophoe (Imperial Club), he and Rhee were diametrically opposed. At that time, Rhee might easily have been sentenced to death, yet Rhee later wrote how amazed he was to find Hong determined to save his life; instead he was sentenced to 100 blows on the buttocks and life imprisonment. He also wrote that Hong gave orders to be gentle when the beating was performed, so that after the 100 blows his skin was not even broken.